I was just talking to my dad on the phone and we had this big philosophical talk about life as we used to have when I was a teenager. That conversation helped me to realize that some of the biggest life lessons are so simple, yet can also be the ones that will change your life forever. A lot of you may have already heard this, but I can't remember one teacher at school who told me this. No one actually ever did. I had to learn on my own. Every single moment we have a choice to see what we want to see. So why not choose to see the light instead of darkness, positive over negative, love instead of hatred, to swoop jealousy for compassion? It might not change the circumstances and situation itself, but what will change for sure is our experience of it. 2. Our thoughts are much more powerful than we think. How would you feel if I told you that you are the ugliest person I've ever met, that you are worthless, stupid and no one will ever love you because you are not smart, thin, rich (fill in the blank) enough? And now check how many of us say all those things to ourselves every day. We got so used to these toxic thoughts over the years that we sometimes don't even realize how we treat and harm ourselves. Most of us would never say those things out loud to our partners, friends, not even to our biggest enemies. So let's try to be mindful about the way we speak to ourselves. 3. Even the smallest thing can change one’s life. I truly believe in Karma. I believe in 'You receive what you give.’ One small change every day can have such an impact. And though we don't always witness the outcome and don't get a reward for the good things we've done, this doesn’t mean it didn’t mean anything to anyone. So how about starting a new practice that will take only a moment, but can change our day and one of the people around us? Next time you’re in a situation where you feel uncomfortable, instead of trying to look busy writing that reeeally important text or email (read: scrolling down Facebook feed), how about you say hi and strike up a conversation with the person next to you? We might realize that by opening up to others, we don't lose but rather receive -- a new friend maybe, or a lesson from a little girl that we shouldn't forget to play no matter how old we get or how difficult life gets. Let's see if we can do the exact opposite of what we would normally do, one simple thing a day. We never know, we might change someone else's experience of that exact moment, after all life is but a collection of moments big and small. 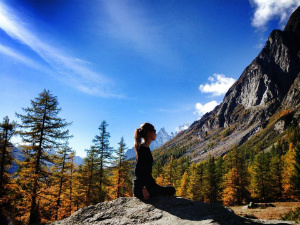 By Tania Marekova – Born in Slovakia but living in Chamonix in French Alps, Tania is currently completing her 200-hr yoga teacher training. She is passionate about yoga, meditation, green smoothies (with kale), and believes everyone can follow their dreams and find their path and happiness.